You won’t believe the benefits of installing a geothermal heating and cooling system in your new or older home! Call 610-459-1098 today to find out about how you could be saving 40% – 60% on your energy bills! Geothermal uses the free and plentiful stored solar energy underground and it’s naturally renewed. It will never run out. If you live in Delaware County, Chester County or Montgomery County in Pennsylvania as well as New Castle County, Delaware, you could be saving thousands of dollars per year on your heating and cooling expenses by installing a geothermal system in your home. The Department of Energy and the EPA recognizes geothermal systems as the most environmentally friendly, cost-effective and energy efficient heating and cooling technology available. So you can make a significant contribution to a cleaner environment — while saving up to 60% on your home’s energy bills. Questions about Geothermal? Click Here for our Geothermal FAQ Page! Ground source heat pumps (GSHPs) are systems that tap into the stored heat energy of the greatest solar collector in existence: the earth. The earth continually absorbs the sun’s heat and stores it at a relatively constant temperature. Geothermal systems use this free energy to aid in heating and cooling homes and buildings. Accessing this incredible renewable energy source provides for very high comfort at a very low operating cost. Simply stated, ground source heat pumps work by circulating environmentally friendly antifreeze solution through plastic pipe loops buried beneath the earth’s surface, usually in wells approximately 300 feet deep. During the winter, the fluid collects free heat (temperatures higher than the outside air) and carries it through the system where more heat is efficiently generated by a heat pump. This heat is then used to heat your home or building. During the summer, the system reverses itself to cool the building by pulling heat from the building, carrying it through the loops and placing it in the ground. As a bonus, this process can create free hot water in the summer and deliver substantial hot water saving in the winter. Geothermal units utilize some of the same technology found in your home’s refrigerator. They are both devices that move heat energy. A refrigerator removes heat from food. A geothermal system removes heat energy from the earth to heat your home and removes heat energy from inside your home to cool it. Both technologies rely on a scientific principle that states “energy (heat) flows spontaneously from an area of high concentration (hot body) to an area of low concentration (cold body).” Heat flows from hot matter to cold matter. Never vice-versa. It’s why ice cubes melt on a hot day, and why boiling water cools after you remove it from the stove. Energy/heat wants to naturally disperse, and it will do so unless hindered by an outside force. This applies to geothermal heating and cooling systems. In nature, the ground serves as a giant solar collector, storing heat energy a few feet below its surface. Here, temperatures remain very constant and moderate, unaffected by fluctuating outdoor temperatures. Energy is exchanged using a series of pipes buried below the earth’s surface (closed loop), placed in a pond (pond loop), or with well water (open loop). Applying the principle stated, we know that in cold outdoor weather, the warmer earth will gladly release its heat energy into the cooler loop. This heat is absorbed from the warmed loop by cool refrigerant in the water-to-refrigerant heat exchanger (coax). Finally, the heat is released from the warmed refrigerant into the cooler house (via supply air ducts) by the air-to-refrigerant heat exchanger (air coil). As heat is drawn away from the earth loop to the house, the loop is cooled again to a point where its temperature is lower than the surrounding soil and the process repeats. During warm outdoor weather, the cooler earth serves as a heat sink. Heat is absorbed from the house by the cool refrigerant in the air coil (via return air). The cool loop fluid absorbs heat from the warmed refrigerant in the coax. (This heat can also be diverted to created hot water using the desuperheater.) Because the loop is now warmer than the cool earth, the heat simply moves away from the loop—the area of high concentration, and drawn into the cool earth—the area of low concentration. 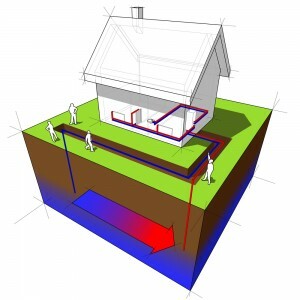 Heating Mode: During heating, a geothermal system absorbs the heat from the ground via the earth loop. The heating cycle starts as cold, liquid refrigerant passes through the “loop-to-refrigerant” heat exchanger (coax, and also the evaporator during heating). The coax is made of copper, and consists of a tube within a tube—environmentally friendly anti-freeze from the loop travels through the inside tube, refrigerant passes through the outer tube. As the loop fluid flows through the coax, the heat energy transfers from the loop fluid to the refrigerant through the copper wall separating the two. This heat transfer causes the cold liquid refrigerant to turn into a gas. (Unlike water, refrigerant changes from a liquid into a gas at a very low temperature.) The now gaseous refrigerant is sucked into the compressor where it is compressed. Compression causes the refrigerant to get very hot (approx. 165° F). It is then discharged through the reversing valve and into the air coil. The air coil is a radiator-like device that has thin aluminum “fins” attached to the copper refrigerant tubing. The refrigerant passes through the air coil (the condenser during heating). As air from the return air duct system passes over the air coil, heat is released from the refrigerant and absorbed by the cooler air. The result is warm air (typically 95° to 105° F) which is delivered through the duct system by the blower to heat your home. The refrigerant, now cooled again, passes through the expansion valve (which acts as a flow control), returning to the coax where it can accept more heat from the warmer loop fluid. This process is continuous during the heating mode. Cooling Mode: During cooling, a geothermal system rejects the heat from the indoor air into the earth loop. The cooling cycle starts as cold, liquid refrigerant passes through the air coil (the evaporator during cooling). As the refrigerant flows through the air coil, the heat energy transfers from the warm return air to the refrigerant. This heat transfer causes the cold liquid refrigerant to turn into a gas. The compressor draws the refrigerant gas, compresses it, and discharges it through the reversing valve. After compression, the hot refrigerant passes through the coax (the condenser during cooling). In the coax, the hot refrigerant releases its heat energy to the cool loop fluid through the copper walls. Now cooled and liquefied, the refrigerant passes through the expansion valve, back to the air coil. Warm air passing over the cool air coil causes the air to be cooled and dehumidified. It is then blown through the air ducts to cool your home. This process is continuous during the cooling mode. Hot Water Mode: Most geothermal units installed in homes have an optional feature called a desuperheater. This component consists of a refrigerant-to- water heat exchanger installed at the discharge of the compressor. The hot gas at this point is in a “superheated” condition. In the desuperheater, the refrigerant releases some of the heat into the cooler water through the copper wall of the desuperheater heat exchanger. A small circulator moves the water from the water heater to the heat pump and back to the water heater. This excess hot gas is available in both the heating and cooling modes. However, there is a greater hot water benefit during cooling because some of the heat that is extracted from the air ends up in the superheat, and is transferred to the water. The amount of hot water generated is a function of the run time of the unit. On very hot days and cold days, the desuperheater may be able to generate the majority of the hot water required for the home due to the long run times of the unit. On milder days when the unit has short duty cycles, the electric elements in the water heater will maintain the desired temperature so there will always be enough hot water. A safety device (sensor) shuts off the circulator for the desuperheater in the event that the water temperature reaches 130° F.
Installing a geothermal system in a typical home is equal, in greenhouse gas reduction, to planting an acre of trees, or taking two cars off the road. You bet it is; and your neighbors will be green with envy at your energy cost savings, too! Please call us today for a free, no obligation evaluation and estimate.